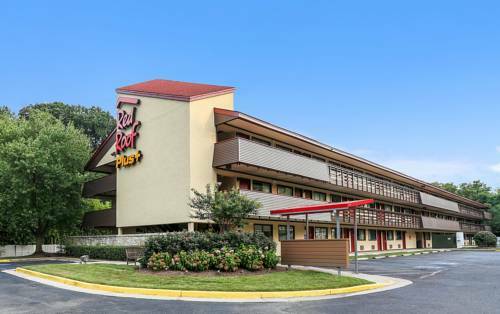 Just one mile from the Metro for easy transportation, and accessible from both I-95 and I-495, Red Roof Washington DC Alexandria is has newly renovated rooms, is 100 percent Smoke-Free and 2 miles south of Old Downtown Alexandria and only 5 miles from National Harbor and Crystal City. The Pentagon, Arlington Cemetery, downtown Washington DC, Ft. Belvior, and Mt. Vernon are all within 10 miles of this hotel. Located just minutes from restaurants and shopping. The friendly staff and the convenience of being just 8 miles from downtown Washington DC make this location a great place to stay. Experience Red Roof PLUS+. Adding more WOW to your stay! Discover an enhanced experience with all new rooms and our most requested higher-end amenities. Just one mile from the Metro for easy transportation, and accessible from both I-95 and I-495. This hotel is near MGM Casino, National Harbor, Gaylord National Convention Center National Harbor, Tanger Outlet Mall and Old Downtown Alexandria within 3.5 miles. Crystal City, Springfield Mall and Pentagon City Mall within 6 miles. The White House, Pentagon, Arlington National Cemetery, Georgetown, Fort Belvoir, and George Washingtons Mount Vernon are all within 10 miles of this hotel. Located just minutes from restaurants and shopping. The friendly, helpful staff and the convenience of being just 8 miles from downtown Washington DC make this location a great place to stay. When you check in, check out the fantastic new amenities in our NextGen design rooms! The rooms at this 100% Smoke-Free inn feature a stylish, boutique design with all new furniture, spa-inspired bathrooms with modern vessel sinks, new comfy Rest Suite beds by Serta, plush high-end bedding, modern design flooring, comfortable new seating and a large, flat-screen TV. This Red Roof PLUS+ hotel also features Premium Rooms with a snack ready in your room! Microwave & refrigerator are available in Superior, Deluxe and Premium room types. All rooms offer free Wi-Fi, free local/ long distance calls, hair dryer and iron/ & ironing board. Experience our free gourmet coffee and tea in the lobby. This location offers On Command Video with a selection of free TV channels, pay-to-view premium channels, and movies. One well-behaved family pet per room is welcome.